The Territory is a great place for Aboriginal women to step into mainstream political representation. A new chapter of this story unfolded in the town council chambers on Monday: Bess Price, the NT Minister for Local Government, officiated at the swearing in of her daughter, Jacinta, as a Councillor. Cr Price came second in the recent by-election in a field of seven candidates vying for two vacancies. The most votes went to Jamie deBrenni who was also sworn in on Monday. 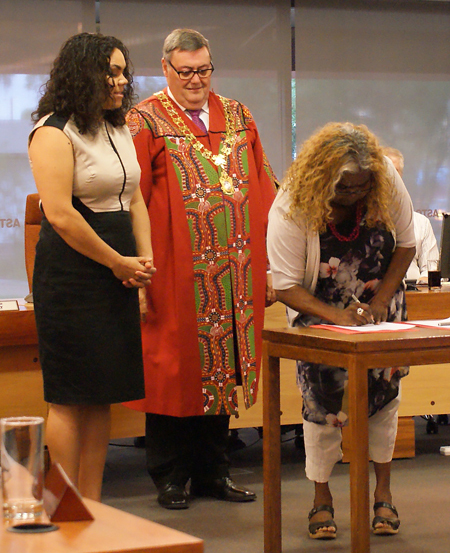 Alderman Sandy Taylor was the first Aboriginal woman on the Alice Springs Town Council. To the best recollection of historian Alex Nelson (and this writer’s), over the years there were three Aboriginal men: The first was Bob Liddle, elected in 1984. Later Des Rogers and John Rawnsley were aldermen. At present Cr Chancey Paech is an incumbent although he may not stay for the term as he has accepted pre-selection by Labor as the candidate for Namatjira in the next Territory election. Barbara Shaw was a council candidate several times, but has not succeeded. Betty Pearce tried in 1992. There were 11 candidates for the 10 positions and she was the one who missed out, recollects Mr Nelson. ABOVE: Bess and Jacinta Price are pictured with Mayor Damien Ryan. Photo courtesy Alice Springs Town Council. Congratulations Jacinta on your election to Council. May you have a fruitful and rewarding experience and serve the community well. Great to see you taking the plunge! Many thanks, Melanie and Jacinta for pointing this out. And a big SORRY to Sandy for omitting you! But we did mention Chansey. We’ve corrected the error in the story. Sandy Taylor was a councillor and an Indigenous woman. And Chansey Paech would make it four male Indigenous councillors.